In this chapter, the historical development of Old Aleppo is briefly presented, noting its designation values as a World Heritage Cultural Site in 1986. The significance of Old Aleppo goes beyond such values. Therefore, the sociocultural, historic, economic, identity and intangible values of Old Aleppo, along with its authenticity, integrity, and outstanding universal values, are questioned as the drivers for post-conflict reconciliation. Accordingly, the Historic Urban Landscape approach, as a leading heritage policy document, is adopted and tested on a pilot area inside the intra-muros city of Aleppo. The aim is to propose an agenda for an inclusive reconciliation in Old Aleppo and maybe elsewhere in Syria. ICCROM, & UNESCO. (2000). Riga Charter on authenticity & historical reconstruction in relationship to cultural heritage. Available at: http://www.vilagorokseg.hu/_upload/editor/UNESCO_hatteranyagok/Riga_Charter_2000.pdf. Cited 15 Aug 2017. ICOMOS. (1966). Resolutions on the regeneration of historic urban sites. Available at: https://www.icomos.org/publications/93towns7b.pdf. Cited 15 Aug 2017. ICOMOS. (1994). Nara document on authenticity. Available at: whc.unesco.org/document/116018. Cited 15 Aug 2017. ICOMOS. (1996). Declaration of San Antonio: Authenticity in the conservation and management of the cultural heritage. Available at: https://www.icomos.org/en/charters-and-texts/179-articles-en-francais/ressources/charters-and-standards/188-the-declaration-of-san-antonio. Cited 15 Aug 2017. ICOMOS. (2003). Charter-Principles; analysis, conservation & restoration of architectural heritage. Available at: https://www.icomos.org/charters/structures_e.pdf. Cited 15 Aug 2017. ICOMOS. (2008). Québec declaration on the preservation of the spirit of place. Available at: http://whc.unesco.org/uploads/activities/documents/activity-646-2.pdf. Cited 15 Aug 2017. ICOMOS. (2011). Guidance on heritage impact assessments for cultural World Heritage properties. Available at: https://www.icomos.org/world_heritage/HIA_20110201.pdf. Cited 15 Aug 2017. ICOMOS. (2017). Guidance on post trauma recovery and reconstruction for World Heritage Cultural Properties. Paris: ICOMOS. Available at: http://openarchive.icomos.org/1763/19/ICOMOS%20Guidance%20on%20Post%20Trauma%20Recovery%20.pdf. Cited 15 Aug 2017. Krakow. (2000). Charter of Krakow: Principles for conservation and restoration of built heritage. Available at: http://smartheritage.com/wp-content/uploads/2015/03/KRAKOV-CHARTER-2000.pdf. Cited 15 Aug 2017. UNESCO. (1992). Charter of Courmayeur: Protection of artistic and cultural patrimony. Available at: http://www.unesco.org/fileadmin/MULTIMEDIA/HQ/CLT/pdf/Charter_Courmayeur_en.pdf. Cited 17 Aug 2017. UNESCO. (2005). Vienna Memorandum on world heritage and contemporary architecture. Available at: http://whc.unesco.org/archive/2005/whc05-15ga-inf7e.pdf. Cited 15 Aug 2017. UNESCO. (2011). 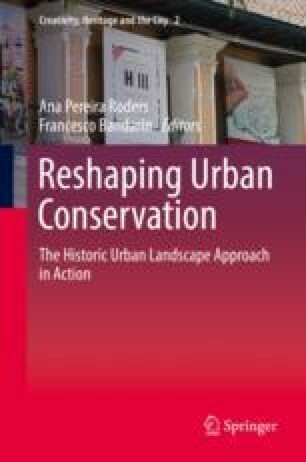 Recommendations on the Historic Urban Landscape. Available at: http://whc.unesco.org/en/activities/638. Cited 15 Aug 2017. UNESCO. (2015). Document for the integration of a sustainable development perspective. Available at: whc.unesco.org/document/139146. Cited 17 Aug 2017. UNESCO. (2016a). Operational guidelines for the implementation of the World Heritage Convention. Available at: 2017. http://whc.unesco.org/en/guidelines/. Cited 15 Aug 2017. UNESCO. (2017a). Convention concerning the protection of the World Cultural and Natural Heritage. World Heritage Committee, 41 session, Krakow, Poland July, 2017. Available via: http://whc.unesco.org/archive/2017/whc17-41com-7BAdd-en.pdf. Cited 15 Aug 2017. UNESCO. (2017b). World Heritage Centre. http://whc.unesco.org/en/hul/#history. Cited 15 Oct 2017. UNESCO & DGAM. (2017). Table of actions for the recovery of the Ancient City of Aleppo following the technical and coordination meeting for the Ancient City of Aleppo. Beirut. http://whc.unesco.org/en/news/1639/. Cited 15 Aug 2017. Wikipedia. (2018). Aleppo – Notable natives. https://en.wikipedia.org/wiki/Aleppo. Cited 15 Aug 2017.